Modern businesses are evolving fast. Driven by technology, how and where we work is changing. Within the next three years, The International Data Corporation (IDC) predicts that up to 75% of the workforce will be mobile. Smart working requires smart technology and processes. IDC has found that, to increase their productivity, one in three businesses are actively planning for a digital world. By integrating OKI’s smart multifunction printers (MFPs) into their workflow, businesses can overcome document related challenges that waste employees’ time and contribute to a substantial loss in productivity each year. Streamlining document-intensive processes, OKI’s smart MFPs integrate with bespoke systems and third party solutions recreating documents as digital data, ready to be shared and accessed securely across the business. Compatible with Google Cloud Print and AirPrint by Apple Inc, OKI Europe’s smart multifunction printers (MFPs) enable businesses to print remotely and securely over wireless networks so that wherever in the world you or your employees maybe, you can enjoy safe, seamless connected working. 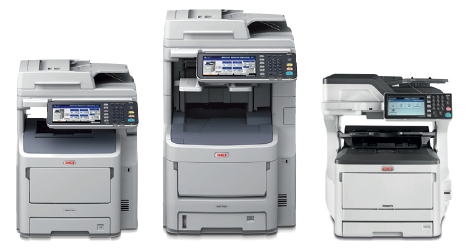 OKI Multi-Function Printers are designed for all types of businesses from small/medium based to large corporate firms. If this sounds like what your business needs then please get in touch today to find out what RGB Solutions can do for you.